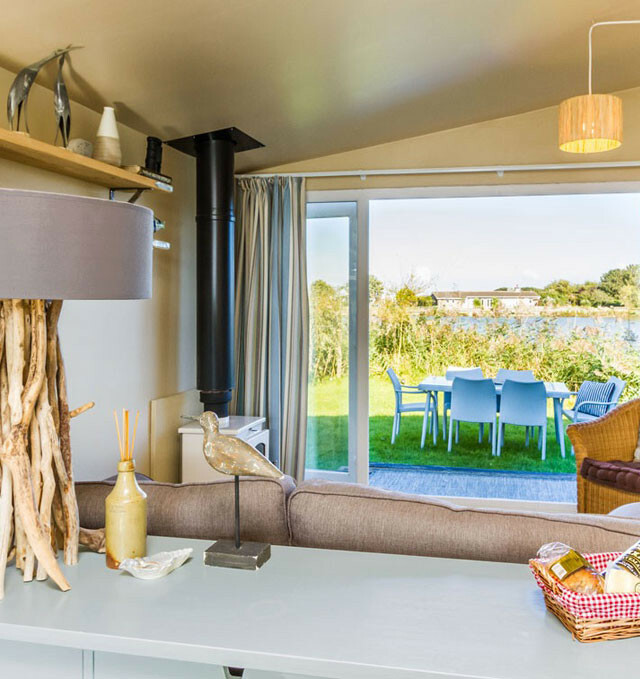 Seaside Lodge is a 1950’s chalet that has been stylishly updated into chic, lakeside cabin. Overlooking a private fishing lake and just moments from the beach, it is a hidden gem in the idyll of Anderby Creek. Discover the beauty of Lincolnshire’s Coastal Country Park area - its tranquil rural scenes, wildlife trails and untouched fields. Explore the wild, secluded beaches with their windswept dunes, the coastal grazing marshes and the Lincolnshire Wolds nearby. This delightful cedarwood cabin is one of a handful of homes circling the peaceful fishing lake. Its garden is a haven for utter relaxation and is backed by the sound of birdsong and the gentle lapping of the water. Inside, it is an eclectic mix of seaside-luxe and quirky-kitsch, with a myriad of characterful trinkets and cosy home comforts. Washed-up coastal materials have been used to create unique pieces and include seashell art and driftwood mirrors. A light-filled living area is the focal point of the lodge and is a blend of retro curios and sophisticated furnishings. Look out for the classic fish sculptures or the natural driftwood lamp or the 1950s souvenir pottery and aquarium light. Rows of quality cookware line the homely kitchen shelves, along with a Nespresso coffee machine and a basket of tasty, local welcome treats. Pick a book from the library, sit down to a game of scrabble, or curl up beside the wood burner with some fresh popcorn, one of the lodge’s DVD collection of classic movies and watch the starry nights. Beyond the tranquillity of the lake is Lincolnshire's Great Outdoors, with its award-winning beaches (many dog-friendly) just a few seconds stroll away. The immediate surroundings have no tourist-filled piers or bustling arcades, you can enjoy good, old fashioned fun with your bucket and spade. Wander around feeling the peace of Anderby Creek or ramble through the rolling countryside and its stunning, nature reserves. Spot rare birdlife or interesting flora, before casting your fishing rod into the private lake waters from a fishing peg adjacent to the lodge. 14 Lakeside, Anderby Creek, Lincolnshire, PE24 5XS.